Formerly known as Ernabella, Pukatja is a remote aboriginal community in South Australia’s APY Lands. Pukatja is approximately 1400 km from Adelaide, by road, 200 km of which is unsealed, dirt roads. Many of the communities in the APY Lands use Mick Bosco, a travelling builder and maintenance provider. 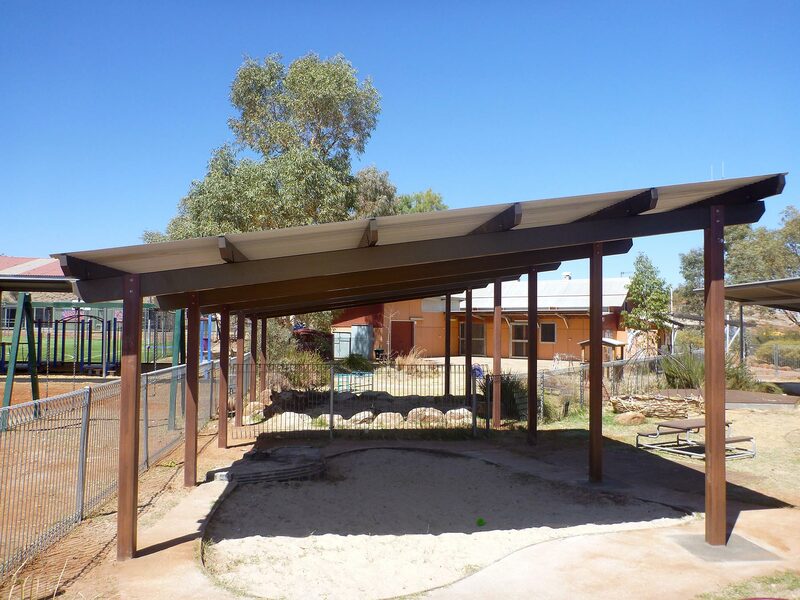 The local school, Ernabella Anangu School, approached Mick to supply a Capricorn shelter from the Terrain catalogue that they’d seen and liked. 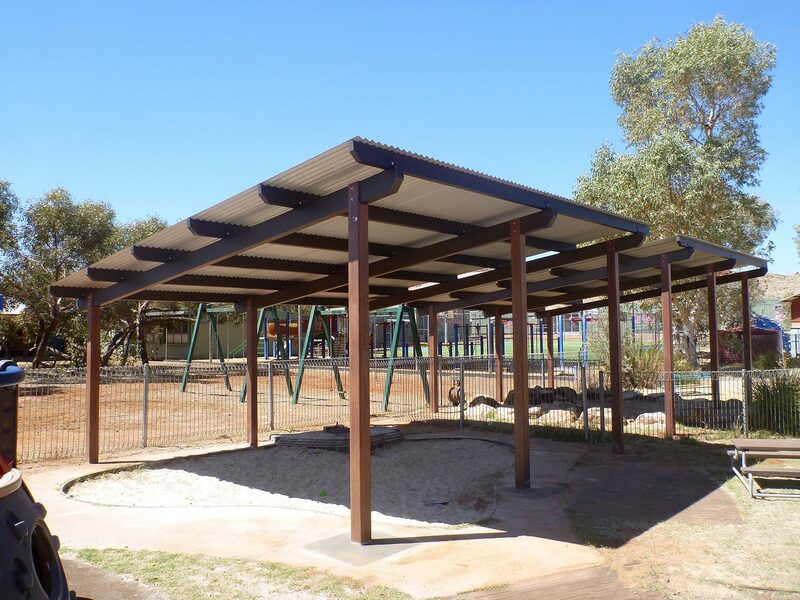 The school, with the help of Mick and our product team at Terrain, settled on the Capricorn shelters because they are the only shelter that offers a span of 6m from front to rear, required for the space being covered, and Mick subsequently approached Terrain for pricing. The space needing to be covered was some 12m x 6m, so two Capricorn 6m x 6m shelters, side by side, were supplied in a Timber Effecta finish, to give the appearance of timber, without the maintenance hassle. 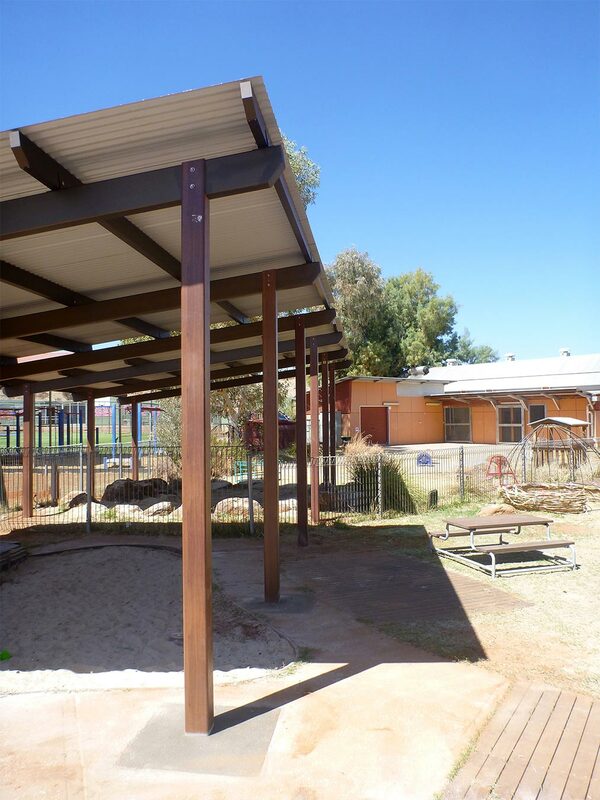 All posts were required to be subsurface, in-ground footings because the shelters were being installed in a sandpit at the school. The shelters were manufactured and delivered to Terrain Group in Adelaide, where Mick Bosco picked them up and transported them for installation to Pukatja himself. Completed during the course of the school holidays, the school was extremely pleased with how the shelters turned out and their service by both Mick and Terrain. We would like to commend Mick Bosco for his great installation work. We have worked with Mick a number of times and he’s always been a pleasure to deal with. “I found the people at Terrain Group very helpful & friendly to deal with, keeping me updated with the progression of my order I had in the system. 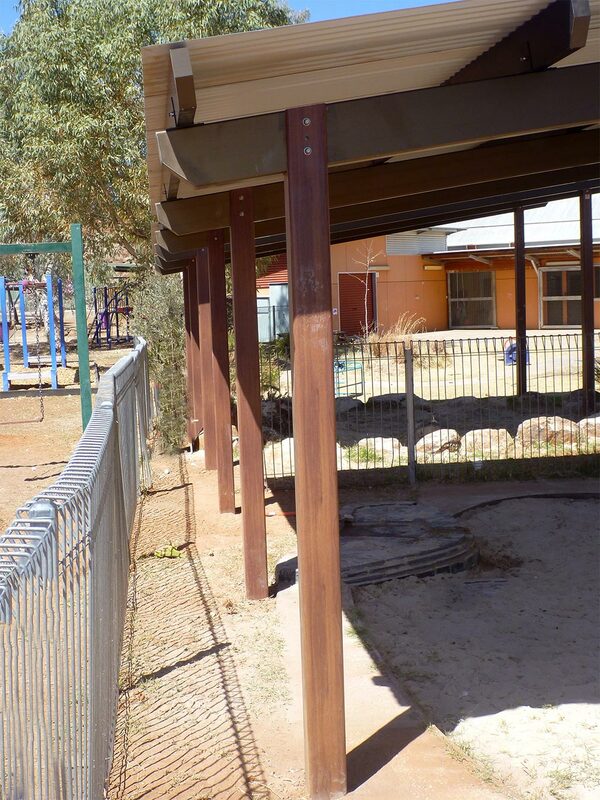 The side by side 6 x 6 shades that were created at the Ernabella school on the APY Lands look fantastic. The principal Erin McQuad wanted the timber look posts so they would blend in more with the surroundings where they were erected.